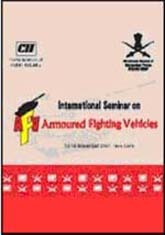 The Seminar on Armoured Fighting Vehicles was held on 14 & 15 November 2007 at New Delhi. Rao Inderjit Singh, Hon’ble Minister of State for Defence Production, inaugurated this first ever Seminar on Armoured Fighting Vehicles. Other speakers at the Seminar included General Deepak Kapoor, PVSM, AVSM, SM, VSM, ADC, Chief of the Army Staff, Lt Gen KDS Shekhawat, PVSM, VSM, then Director General Mechanised Forces, Maj Gen D Bhardwaj, VSM, then Additional Director General Mechanised Forces, Maj Gen GS Malhi, VSM, General Officer Commanding, Armoured Division, Maj Gen Surendra Nath, then General Officer Commanding, Infantry Division, Indian Army, Mr V R S Natarajan, Chairman and Managing Director, Bharat Earth Movers Limited and Mr S Sundaresh, Director, Combat Vehicle Research and Development Establishment. Deliberations at the Seminar were focused on futuristic requirements of an AFV in the developing battlefield environment, global trends and technologies in AFVs, upgradation requirements of existing fleet of AFVs to meet the challenges of emerging battlefields, public – private partnership, technology enhancement affecting training philosophy and training aggregates etc. Over 350 participants from India and abroad participated in the Seminar.